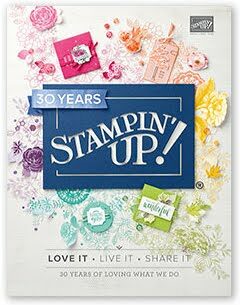 You only have until 11:50pm MST tonight (August 31st) to get signed up to become a Stampin' Up! Demonstrator with the Mini Starter Kit for only $85! Don't miss this great opportunity--it doesn't come around very often. Click HERE for all the details on the kit, and all the incentives offered! Rubber stamps, Sizzix cutting dies, and patterned papers featuring Build-A-Bear Workshop bears, and their clothing and accessories. A new line of charm jewelry, including 3 different sizes of charms whose artwork you can replace over and over again, and two matching chains, plus a special stamp set sized to work perfectly for creating your charm artwork! While this won't be available September 1st, it will be very soon...this is a digital scrapbooking program, where you use Stampin' Up! 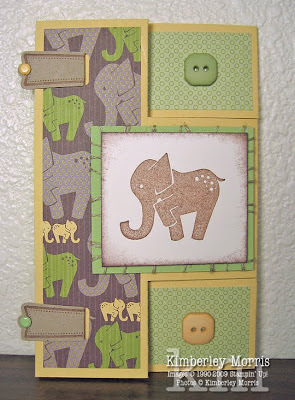 art (including stamp sets and patterned paper) to make your creations. You will be able to use SU! 's print service to create albums (hard or soft bound books), cards, calendars, and more! Don't wait to become a Demonstrator--you have nothing to lose, and everything to gain, because you automatically get 20% off ALL your purchases (except business supplies like order forms) from the day you join. Plus, you get the support of the Stampin' Up! Demonstrator web site, monthly design and business magazine, and hundreds and thousands of stamped samples, and product and technique videos and tutorials available only to Demonstrators. There is no obligation to remain a Demonstrator after your initial quota period expires, you pay nothing, and you keep all the great supplies. And honestly, I offer all former members of my downline a permanent discount on purchases from me, in the event they can no longer remain a Demonstrator, so you'll always have that with me. It's a heck of a deal, don't miss it! Please feel free to call me at 719-205-5957 with any questions you have before you sign up. I received a question in email on how to die organza ribbon with a sponge and ink pad, as I'd mentioned I'd done in THIS POST, to tie on the card pictured below. I will post written instructions below, but no pictures, for the sake of time. If you have questions then just shoot me an email, and I'll see about adding some pictures later to clear it up. But if you walk through this, you'll probably understand it. Hold the end of the desired length of ribbon (the end closest to you) down with your left hand fingers so it is just starting to lie on the pad, flat. Then, hold a sponge in your right hand fingers, and press down on the ribbon to hold it on the ink pad. Then pull the ribbon with your left hand, so that the ribbon is sandwiched between the ink pad and sponge as you drag it. As you drag the ribbon across the pad, it gets stained with the ink. You need to press firmly enough with the sponge to keep the ribbon on the pad, but gently enough to allow you to pull the ribbon through. I pull the ribbon through maybe 3-5 times on one side, then turn it over flat on the other side and pull it through a few times. You will usually want the same amount of color on both sides, so pull it through the same amount of times on each side. You can pull it through fewer times for a lighter color, and more times for a deeper color. It's best to set out the ribbon to dry, like maybe overnight, but it mostly dries right after you do it. So, if you don't mind getting your fingers slightly inky, you can actually tie the ribbon on right away. Just be careful on light card stock because if the ribbon is still damp, it can drag some of the color off onto the lighter card stock as you are pulling on it to tie it. If you want to use the stained ribbon right away but find it's still too damp for you to want to work with it, you can pinch the stained ribbon flat in some folded paper toweling, and pull the ribbon through to try to drag off some of the excess ink, to help it dry faster. Your ribbon may lighten up a bit using this method. You can also quick dry your ribbon with a heat gun, but ribbons like organza, with high synthetic content, will melt and warp when they get too hot. The melting creates an interesting look, but it is hard to work with to tie a bow, so I suggest not trying that technique until after your bow or knot is tied. And beware of scorching the ribbon or the card itself...use a very light hand from farther away than you might suspect is necessary, with the heat constantly moving, until you get a feel for the crinkling/melting point of the fiber of your particular type of ribbon. 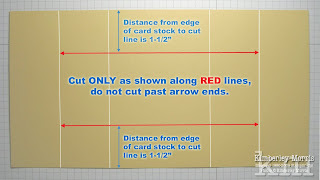 You will now make a CUT 1-1/2" down from the top edge and 1-1/2" up from the bottom edge, and your cut line will run ONLY from the first score mark, to the last score mark, as shown below. You can do this with a Hobby Blade and straightedge, or use the Personal Paper Trimmer, as I did. After that, it's just folding parts forward and back, in the manner that will facilitate the fold of the card. The first picture below is a bird's eye view of the card, and then there is a shot from the front, to give you an idea of what folds forward and what folds back. 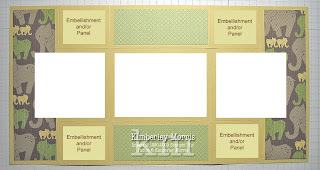 Fold the card back to lie flat, and start embellishing panels. 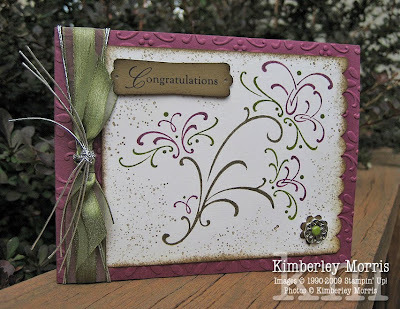 Designer Series Paper is great for this, but you can stamp coordinating card stock to layer, as well. My card has two end panels which are 5-1/4" x 1-1/2", two top and bottom panels which are 3-1/4" x 1-1/4". If you want to make four tiny panels instead of using punches where I have them, those areas would measure 1-1/2" x 1-1/4". That's it--pretty easy, huh? 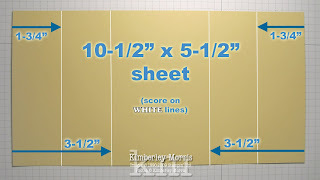 As you master the cutting and scoring, work towards eliminating the score marks that the front and rear panels are covering. 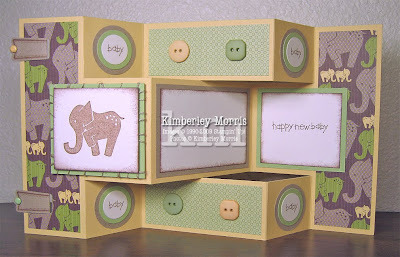 These quick 3D greetings add a simple WOW to any card-worthy occasion. Just be careful what you write inside, because they are so fun to display that you might find your sweet nothings shared in public! The picture below shows what my card looks like when it's folded closed, ready to be mailed, or given to the recipient. 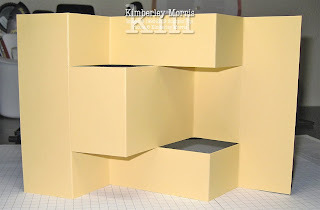 SCRAPBOOKING IDEA: Place these on scrapbook pages, with a "pull" tab for 3D viewing (be sure you only adhere the very back panel of the card to the scrapbook page so you can open it up!). TIP: When adding two tri-fold cards to a page, flip one of the tri-fold cards over, so that each of them opens out the opposite direction from the center of the page. Order your Stampin' Supplies, for delivery directly to your door, from my ONLINE STORE. While you're shopping, don't forget to get your FREE BUTTONS through the Growing Up Promotion. And remember, the $85 Mini Starter Kit Offer ends in just 10 days (Aug 31st)...sign up and get your FREE IN COLOR MARKERS and FREE STAMP SET from me before it's too late! I know there are tons of other things to show you, but this little guy stole my heart! At Convention, after a demonstration of our new Build-A-Bear product line, the presenter showed us a darling little bear wearing a SU! apron. You'd have thought a new baby had just smiled its first smile with all the cooing and awwwwing going on. Yes, I admit, I was heartily participating in the noisefest. When we found out we could take one home with us, we raised the roof! This little fella sports not only the logo apron, but also his very own stamp! It says: Life Without Stamps...UnBEARable! The stamp is on a little chain, so the bear can actually hold it in his little paw and stamp it himself. (Now you're making those high-pitched squeals that only dogs can hear, aren't you?) 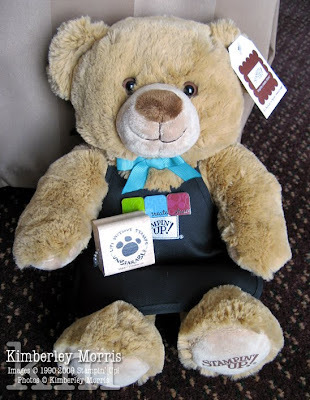 My bear is already itching to fill those pockets on his apron with mini swap cards to trade at next year's Convention! On the bottom of one of his "feet", he displays the Stampin' Up! brand name. Yeah, I agree, it's too cute for words. And so is the new Build-A-Bear product line, which is coming out in September...we will have stamp sets, Sizzix dies, and Designer Series Paper that will keep you and your kids busy for hours. Call me now at 719-205-5957 and be the first on the block to book your Build-A-Bear Stampin' Birthday Party in the Colorado Springs area. We can custom tailor your party to fit both your budget, and your kids' ages. You'll have complete control over the decorations and crafting. You'll only pay for what you want, and the sky is the limit. Go for a simple and fun Paper Bear Dolls experience, or let older kids stamp their art out! You can stop there, or choose to decorate to the nines with a Bear Birthday Banner, Bear Cupcake/Cake Decoration Picks, Bear Goodie Bags, and more. Hurry and reserve your party time today--it will be an event your kids will never forget! Wow! I got home from the Stampin' Up! 2009 Convention on Sunday night, and I'm still not upacked! It was jam-packed full of excitement, information, and creativity! I did very few swap cards (about 15 or so) to swap with some special friends. The card I made is shown below, though my original is just a little bit more embellished than the later cards, because I ran out of silver elastic cord! I think you'll want to click on this picture to see it in its full-size glory. This is the first time I ever used the Shimmery White card stock, and I just love it! You pretty much have to see it in person to appreciate it, but it's like having a layer of superfine glitter all over the surface. My first draft of this swap card was made using this same stamp set and palette, but it had the phrase 'Merry Christmas' on it--stamped in Basic Black on Old Olive and trimmed close around it. The Peanut Gallery at home bemoaned the "non-traditional" colors, so I decided to stick with the Congratulations greeting which is included in the stamp set. Personally, I think these colors would be great for the holidays, but I can see how that might be a little too artsy-fartsy for some folks. Choose for yourself, then shop my ONLINE STORE to order your supplies and have them delivered right to your door! Stampin' Supplies: Wedding Sweet stamp set, Itty Bitty Backgrounds stamp set (speckles), Shimmery White card stock, Rich Razzleberry card stock and marker, Soft Suede card stock and marker, Old Olive marker (and ink pad for dying ribbon), Old Olive Brad (from Earth Elements brad asst), Filigree Brads, Scallop Edge Punch, Modern Label Punch, Boho Blossoms Punch (for little flower under filigree brad), 1/16" Circle Punch, Stampin' Sponge, White Organza Ribbon (dyed Old Olive by dragging it thru ink pad while holding it down with sponge), Silver Elastic Cord. I'll be posting more swap cards and ideas from Convention over the next few weeks and months. I had a great time, and can't wait to show you the Stampin' Up! Build-A-Bear I brought home!!! It's really taking a lot of willpower trying to pace myself. Don't forget, there is an $85 STARTER KIT SPECIAL going on through the end of August. If you want to hear all about Convention, and learn all the nifty tips, techniques, and tricks I brought home with me, then use my Recruiter Authorization Password (newdemonstrator) and go SIGN UP RIGHT NOW! You will have access to my Convention Notes, plus I'll be sharing my Convention experience through downline training all year long. Today I want to post a video, showing how easy it is to apply our decorative vinyl images, which are called Décor Elements. There is a SPECIAL going on right now, where you can order a Décor Elements Growth Chart and receive a FREE applicator tool. This Growth Chart is currently only available through this special offer, which expires on September 30th, so you'll want to run to my ONLINE STORE and get yours ordered right away! Enjoy the video, and please drop me an email, or call me at 719-205-5957 with any questions you may have. Through September 30th, purchase the Décor Elements exclusive Growth Chart, and receive an applicator tool FREE! This darling growth chart is guaranteed to be available only through September 30th (any future availability will be announced at a later date). The decorative vinyl wall cling Growth Chart features a tree with measurements printed along the trunk, marked every 1/2 inch on one side, and every 1/2 centimeter on the other. The colors on the Growth Chart are Old Olive, Taken with Teal, and Chocolate Chip. As with all of our Décor Elements, the vinyl goes on easily, and can be removed without marring even painted surfaces. Create scrapbooking moments by taking photos of your children's height over the months and years. Gift a Growth Chart to your child's school nurse, daycare, pediatrician's office, and don't forget grandma's house! Enter my ONLINE STORE now, and search for the term 'growth' (without the quotes) to order your Growth Chart today. During the month of August, when you spend $35 on stamp sets from the Growing Up section of the 2009-2010 Idea Book & Catalog (pages 74-90), choose a package of Designer Series Buttons absolutely FREE! There are three packages of color assortments to choose from: Playground, Sherbet, and Button Latte. There are tons of great sets to choose from, like Animal Stories, Sock Monkey, and the All In The Family stick figures set, with its coordinating accessories sets. You'll also find plenty of sporting sets, including football, soccer, basketball, baseball, tennis and even surfing! Skateboarding, snowboarding and even dirt biking are featured in other stamp sets. If your teenager is a guitar hero, we've got a stamp for that, too! And for the little ones, check out the Pirate Time and Princess Time stamp sets. We've even got bugs, bears, aliens, robots, and an adorable pony that can be made into a unicorn or pegasus! And the Teacher's Pet stamp set would make a wonderful new school year gift for your child's teacher.